Poke potatoes with a fork on both sides. This will prevent them from bursting in microwave. With a spoon, scoop some of the potato out of each skin, being sure to leave about ¼ inch of potato inside of the skin. 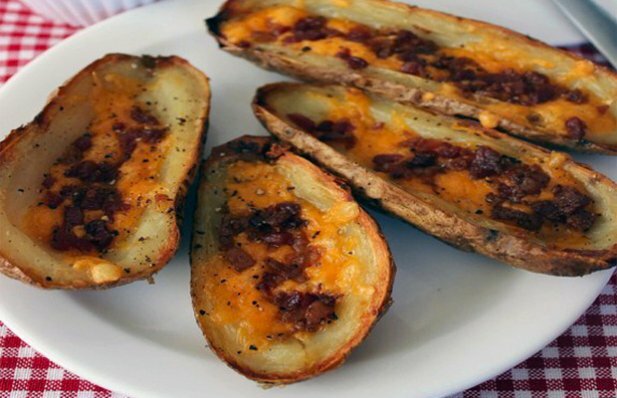 Brush the entire surface of each potato skin, inside and outside, with the melted butter. Place the skins on a cookie sheet, cut side up, and broil them for 6 to 8 minutes or until the edges begin to turn dark brown. Sprinkle 2 to 3 tablespoons of Cheddar cheese into each skin. Sprinkle the ground linguiça onto the cheese. Broil the skins for 2 more minutes or until the cheese is thoroughly melted.